Mom use to make this when we were younger, and she insists that she can't do it anymore, in fact she swears she can't cook anything anymore.... She cooked for us for years and now she'd like to sit back and let someone else do it. That's cool, I don't mind taking the reins. 1. 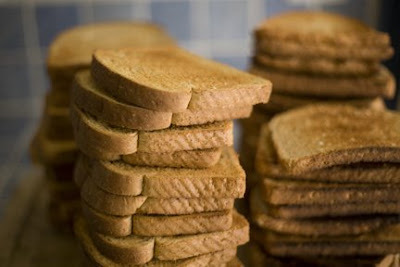 Start by toasting all of the bread. I prefer in the toaster, it gives the bread equal brownness and you can be working on 2 things at the same time. 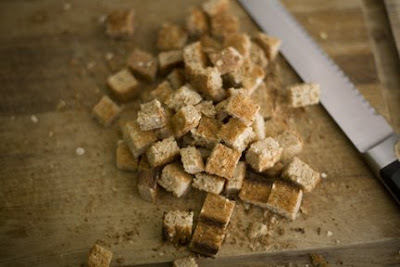 Then chop the bread into 1/2 inch tiles, mom used to tear the bread but I prefer the uniformity of the squares for my stuffing. This part can be done right before assembly or up to a couple days in advance. 2. Saute the sausage until nearly done and add onions, celery, and garlic. Saute until the onions are wilted. 3. If you're preparing your own chicken stock then take this time to do that. 4. 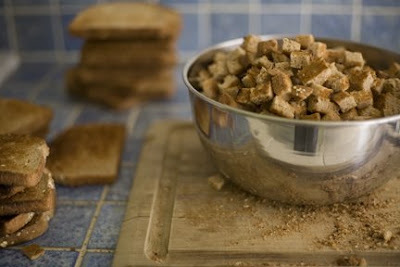 Combine bread with seasonings then add sausage mixture, stir until thoroughly combined. 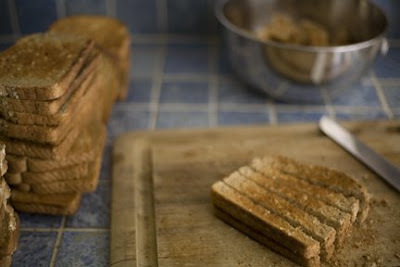 Start adding chicken stock until bread is damp and clumpy. If you don't need it all don't use it all. Add salt and pepper to taste. 5. A little trick I learned from Rachel Ray is to make sure that all of the stuffing has crust, since it is everybody's favorite. So we put some of the stuffing in the bird but it dries out the bird some, so we try to cook the bulk of the stuffing this way. Prepare muffin tins by coating them with cooking spray. Form balls with the stuffing and drop them into the cups. Bake at 375 degrees for 25 minutes checking often. 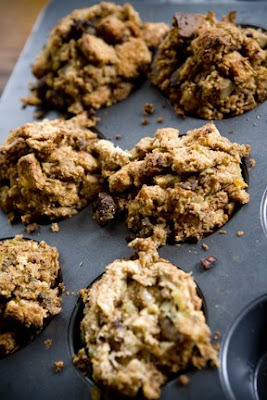 You're looking for brownness and texture from the crust of your stuffing muffins. All of the ingredients are pre-cooked so cook to desired doneness. Hope you like all of the fun recipes. tomorrow we'll be back, I'm not sure what we'll be writing about but I'm sure it's going to be fun.